A soft, flavorful nut native to Persia and China. Walnuts became popular internationally when they were traded along the Silk Road. They are known as English walnuts because the English took the walnuts they purchased along the Silk Road and introduced them to their many colonies. These rich nuts were highly valuable and favored in royal kitchens. 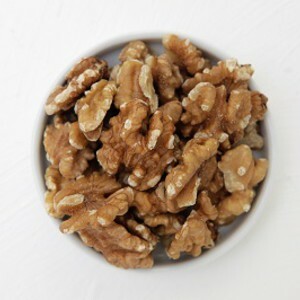 Because of their intense flavor profile, walnuts transition easily from baked goods to savory dishes (they're most closely related to pecans in taste and texture). They're traditionally eaten raw or lightly toasted and add a dense crunch to many dishes. Aside from being an excellent brain food because of their fat content, walnuts are also a good source of copper, magnesium, B6, folic acid, and riboflavin.